Brazilian Race car driver Bruno Senna was born 15 October 1988 in São Paulo, Brazil . HE is a former Formula One racing driver and the nephew of the late three-time Formula One world champion Ayrton Senna. His mother is Ayrton’s older sister, Viviane. His father, Flávio Lalli, died in a motorcycle crash in 1996. He wears a slightly modified version of his uncle’s helmet design. Senna made his Formula One début in 2010, driving for Hispania Racing. He moved to Renault in 2011, replacing Nick Heidfeld as a driver from August. For the 2012 season, Senna drove for Williams driver, alongside Pastor Maldonado. Sadly Senna retired from the Australian Grand Prix, after making contact with Felipe Massa. In March, 2012 Senna finished in sixth place at the Malaysian Grand Prix, and 7th in China. Three races later, his teammate Pastor Maldonado won the Spanish Grand Prix! Senna however retired in a collision with Michael Schumacher. After the race, a fire broke out in the Williams garage. Senna’s car was damaged and four crew members were treated for injuries. Senna finished 10th in Monaco, 17th in Canada. In the European Grand Prix Senna picked up a drive through penalty after a collision with Kamui Kobayashi, dropping Senna to 22nd and last, Senna finished the race in 11th which became 10th after teammate Maldonado was given a 20-second time penalty after a collision with Lewis Hamilton. In Britain, Senna started 13th after grid penalties and after a strong start finished the race in 9th. At the 2012 Belgian Grand Prix Senna scored the first fastest lap of his career after a late puncture dropped him from 8th place to 12th place. Senna finished the season 16th in the Championship on 31 points and was dropped by Williams for 2013 in favour of Finnish rookie Valtteri Bottas. In 2013, Senna raced for Aston Martin Racing in the FIA World Endurance Championship and the 24 Hours of Le Mans. Senna and his co-drivers had a successful start to the championship, winning at Silverstone and then collecting another podium at Spa. At Le Mans, the Aston Martin Vantage GT2 #99 driven by Senna, Rob Bell and Frédéric Makowiecki started from pole position in the GTE class but did not finish the race after serious crash when running 3rd. Makowiecki had no major injures from the accident. In Brazil at São Paulo there was contact with other cars just in front of Senna resulting in Senna making contact with one of the cars causing suspension damage that forced him to retire from the race. In 2014, Senna was added to the Sky Sports F1’s coverage lineup for seven races: Malaysia, China, Hungary, Singapore, Russia, USA and Brazil, alongside David Croft and also provided race analysis with the presentation day throughout the seven Grand Prix weekends. Also in2014, Mahindra Racing confirmed Karun Chandhok and Senna as their Formula E drivers for the 2014–15 season Senna Is also a factory driver for the McLaren GT3 project. 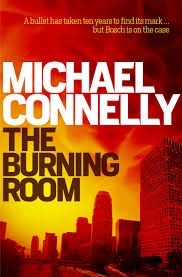 I would like to read The Burning Room by Michael Connelly, The nineteenth novel to feature Harry Bosch. This time Bosch and his rookie partner Lucia Soto are assigned the case of Orlando Merced, a mariachi performer who was shot in a crowded Los Angeles square and paralysed from the waist down. The shooter was never found, and Merced survived for ten years before dying from complications from his wounds. When the bullet is finally removed from his body, Bosch establishes that Merced was shot with a hunting rifle, and that the crime was not a random act of gang violence as originally suspected, but a targeted hit. This new evidence leads Bosch to one of the city’s most powerful businessmen and a controversial former mayor with aspirations of becoming Governor.